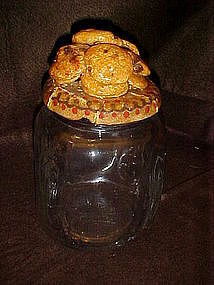 Someone did a cute job making the top to this little cookie jar. Made with real cookies or salt dough and glazed with clear varathane. These chocolate chip cookies look good enough to eat. Measures 9" tall. Lid screws on tight. No chips or cracks. Dough has some cracks in it you can probably see in the picture.